Everywhere Bruno goes it ends up being OMFGz Holy retro nostalgia Batman. I don't think this rumour has appeared in wider circles although it's acknowledged due to his status as being available and having sponsorship behind him that he's a possibility. Even so... The same goes for Sutil and no disrespect to Bruno for given the lack of F1 prep he had before his races he did a respectable performance yet at this time for Williams a Sutil with money makes better sense than a Bruno with money. Williams are a team that are desperately trying to rebuild their reputation, their technical team has been overhauled and needs time to settle and grow, they've changed from Cosworth to Renault power so that's another technical change they have to get on top of. They really need some stability and experience to draw from on the driving front and a Maldonaldo - Senna lineup does not inspire that confidenence. Sutil would be better, but for that matter you still can't rule out Barrichello who is more experienced than any other F1 driver, knows the team and can still drive like a bat out of hell when he needs to. Williams are in quite a decent position, with all the middle-level drivers on the market, they can demand more sponsors from their potential drivers and give them a lower salary as well. However, if they have Senna/Maldonado, it's arguably the worst driver line-up on the grid. Edited 1 time(s). Last edit at 12/22/2011 03:54PM by SchueyFan. > arguably the worst driver line-up on the grid. Come on, Senna isn't that bad. His only problem so far has been consistency. Seems to me like you just have a problem with the guy. Edited 1 time(s). Last edit at 12/22/2011 06:51PM by EC83. Bruno did ok with what he had. He had zero testing in the HRT before his debut and minimal testing in the Renault. But a Maldonaldo - Senna lineup would potentially be the weakest of the mid-field. That's not to slight Bruno nor Maldonaldo but you can't deney that there are currently better drivers available who are realistic prospects. Barrichello, Sutil, Alguersuari? Yeah, I do acknowledge them as potentially better choices for their various reasons(although Sutil is debatable I think). But I think Senna would make massive progress as a race driver if he just gained more experience. 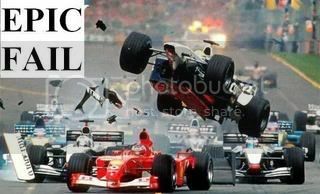 I just don't think it's fair to imply he's one of the worst drivers in F1, when his ability clearly isn't in question. Edited 1 time(s). Last edit at 12/22/2011 08:10PM by EC83. My point is that can Williams really afford to develop Bruno alongside Maldonaldo? Wouldn't Barrichello be the better choice during their current transitional period? And if not him then Sutil comes with the best package of backing and experience. I've always thought Sutil overated, it's like he's been billed as a Lewis Hamilton without the car... But he's a safe pair of hands (pardon the pun), he's young enough to be young yet he's now well experienced and he's proved himself to be competent in the midfield. If it wasn't for Maldonaldo, I'd have less reservations about Bruno at Williams, but Maldonaldo requires pretty much as much development as Bruno does ans having those two together at Williams when they're at their weakest isn't the best recipe for results. If one of the drivers is Barrichello or Sutil you know you can reley on them to bring the car home in the points when it is capable of it. You won't have that with Maldonaldo and Senna. Personally, assuming Maldonado stays, if it were down to me I'd go for Sutil. It pains me to say it, but I just don't think Rubens has got it any more. I'd want to invest in a driver who would likely have a few years left in F1, and I don't think Rubens can quite cut it any longer. Yeah, I'd get Sutil in. His late-season surge surely just puts him ahead of Barrichello. Mainly, as Rubens just isn't as good as he was anymore. With Rubens, I've got to admit his form in 2011 was pretty unimpressive compared to most previous seasons. What I'm not so sure about is whether he should retire on the strength of that or whether he might have another season or two still left. He has had average seasons in the past and bounced back from them(Admittedly even his worst seasons in the past have been better than this season was, although he was always in a car which was generally better than the 2011 Williams). i think it was not a BAD BUILT car, just BAD DEVELOPED during the season ! FFS, does this guy ever shut up with the drivel? Well one of the flaws of the Williams is that they put so much effort into the compact rearend and miniature gearbox in the quest of clean airflow over the rear beam and hence more downforce and stability. This didn't work as a package and was compounded by the lack of exhaust blown diffuser. They actually looked at their most competitive at Silvestone when exhaust blown gadgety was momentarily restricted. In many ways the whole thing reminds me 2004 and the walrus nose... it was marvellous bit of engineering to achieve what they did, but a blind alley in ultimate performance. It certianly wouldn't surprise me if the new Williams has a slightly more conventional rear end, though the change in exhaust regs already remove one aspect where they fell behind on. > > arguably the worst driver line-up on the grid. > just have a problem with the guy. Which line-up so far do you think is worse then? > FFS, does this guy ever shut up with the drivel? Him bragging about it now isn't great, but what Ferrari did at the time certainly was very sporting and to be honest, I'm surprised they did it. > > just have a problem with the guy. > Which line-up so far do you think is worse then? Quite possibly the Lotus one at least - Kimi might be Kimi but he's still an unknown after a couple of years away, and Grosjean's track record in F1 so far speaks for itself. I'd say a Raikkonen/Grosjean line-up is much better than Senna/Maldonado. Even if we say Grosjean and Maldonado are equal as they are both GP2 champions, I can't say that a recent World Champion, even Kimi, would be worse than Bruno. Bruno's a good driver, but nowhere near the level of a WDC, even one who has had some time off. For the record, I also think Grosjean is a much better prospect than Maldonado. It's also worth noting that Grosjean had the odds stacked heavily against him in 2009. He had practically no testing in the 2009 Renault, a car which at best was poor and more often than not a complete dog. He also had Alonso as team-mate, not many established drivers can handle him let alone rookies (Hamilton excepted). Thing is.. Grosjean simply didn't have adequate preparation for his debut (admittedly neither did senna). He'll be better prepared this time round because he'll have a winter's testing behind him. He's a driver who has won titles in practically everything he's raced in (senna doesn't have any titles), he has potential. The only shame is that neither he nor Raikkonen can really show where they are next year. If Grosjean does poorly, then it will all be down to Kimi. If Grosjean does well, then Kimi's head isn't in it. In the eyes of many, there'll be no winners next year at Renault.